Samsung tried to interfere with the activities of its labor union by creating a company union and by following union members and their families, the Seoul Central District Prosecutors’ Office said Tuesday. A total of 13 Samsung employees, including Kang Kyung-hoon, a vice president of Samsung Electronics Co., and executives of its subsidiary Samsung Everland, were indicted without detention on allegations of violating the Trade Union and Labor Relations Adjustment Act. According to the prosecutors’ office, the suspects allegedly formed the company-dominated Samsung Everland Labor Union in June 2011, operating the union until March 2018. 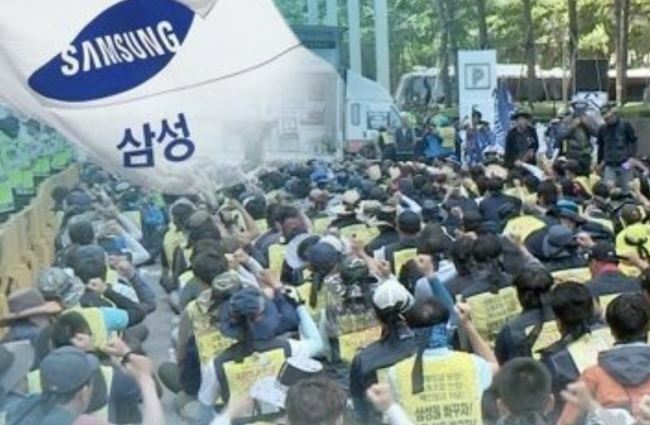 In an attempt to obstruct the collective bargaining process, prosecutors allege, the company concluded an agreement with the company union before its workers created the Samsung Labor Union in July 2011. In addition, the company allegedly tailed Cho Jang-hee, a key member of the Samsung Labor Union, and reported his unlicensed vehicle to police, who then arrested him. The company took advantage of the arrest to fire Cho in 2011, but he was reinstated in March 2017 after years of court battles. The head of the Samsung Everland Labor Union, surnamed Lim, is accused of giving false testimony in court in April 2013 in Cho’s wrongful termination case. The prosecutors also accuse Samsung Everland of illegally collecting information on Samsung Labor Union members’ families by following and watching them. Kang Kyung-hoon, a Samsung Electronics vice president, was brought to trial in September 2018 for allegedly trying to break up the Samsung Electronics Service Labor Union while working in the personnel department of the Samsung Future Strategy Office. Previously, the prosecutors had sought arrest warrants for Kang on two previous occasions involving two separate allegations but both requests were denied.